Fraser Glacier, Alberta on the southern flank of Bennington Peak in Jasper National Park drains into the Athabasca River not the Fraser River. The glacier was reported in the USGS satellite image atlas as having a length of 3.5 km in the 1970’s. In Canadian Topographic maps the glacier extends for over 3.0 km from 2900 m to 2200 m. Today the glacier is barely half that length. The glacier first separated and then the lower section has now melted away. Here we use Google Earth and Landsat imagery from 1996 to 2014 to identify the changes. Bolch et al (2010) noted that from 1985-200 Alberta Glaciers lost 25% of their area. Tennant et al (2012) noted that from 1919-2006 the glaciers in the central and southern Canadian Rocky Mountains lost 40% of their area. 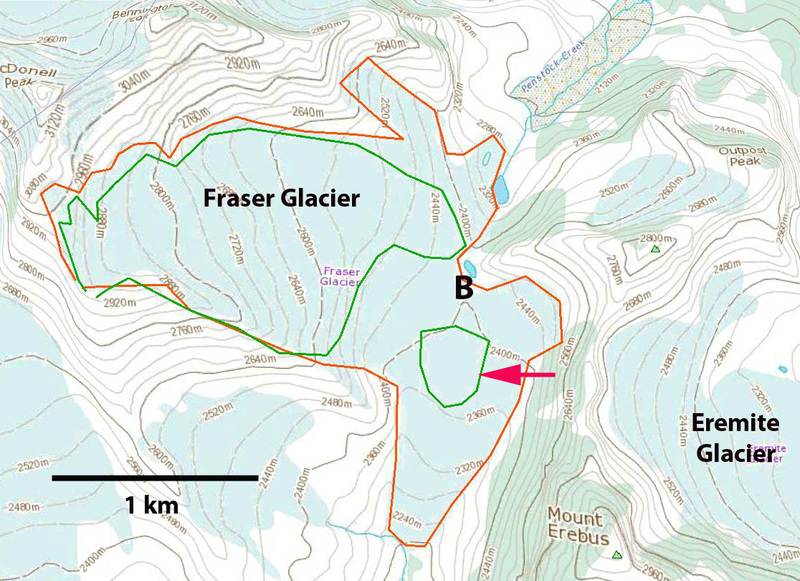 Of the 523 glaciers they observed 17 disappeared and 124 separated, Fraser Glacier falls into the latter category. 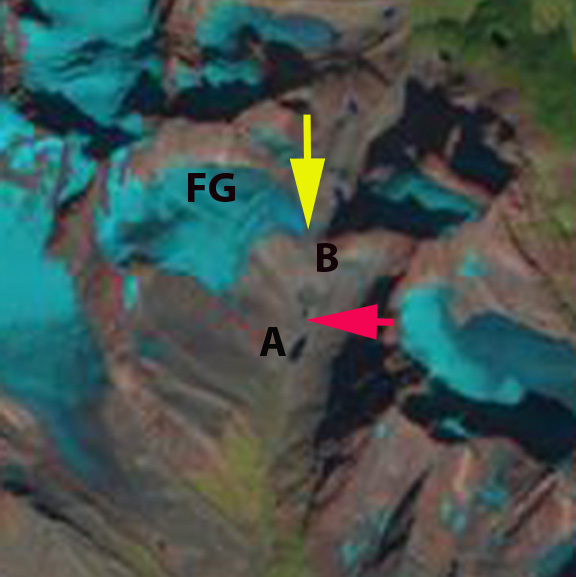 In each image Point A indicates the same location which after 2000 a small lake develops, Point B, is the location where the glacier separated into two parts. 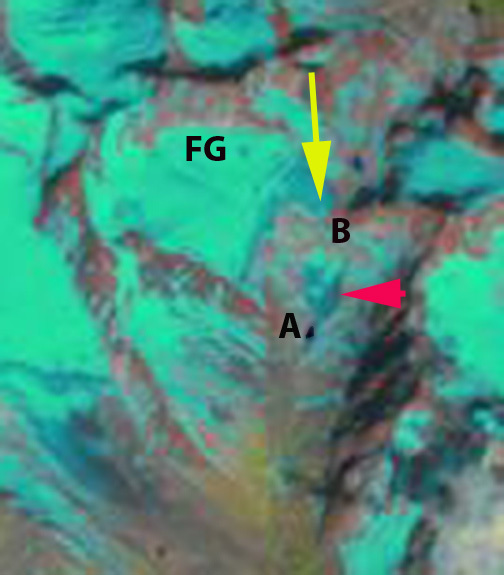 The red arrow indicates the lower section and the yellow arrow the position of the upper terminus in 2014. 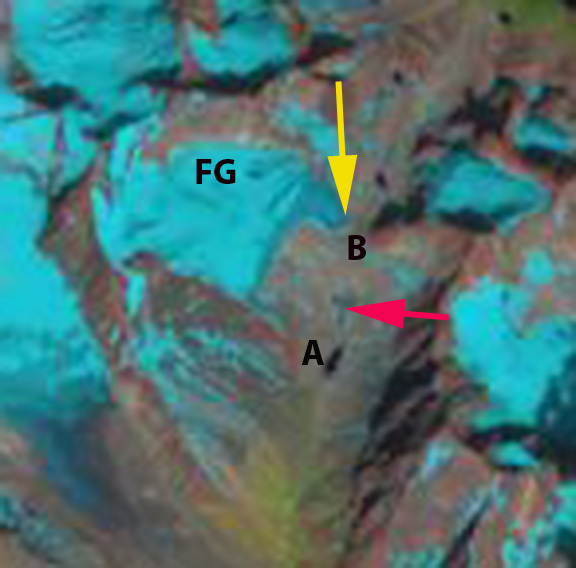 In the map the orange outline is the glacier boundary on the map, while the green line is the 2005 boundary. By 1999 the glacier has separated into two parts, but no lake exists yet at Point A. By 2002 a small lake is developing at Point A and the separation between the upper and lower glacier has increased. 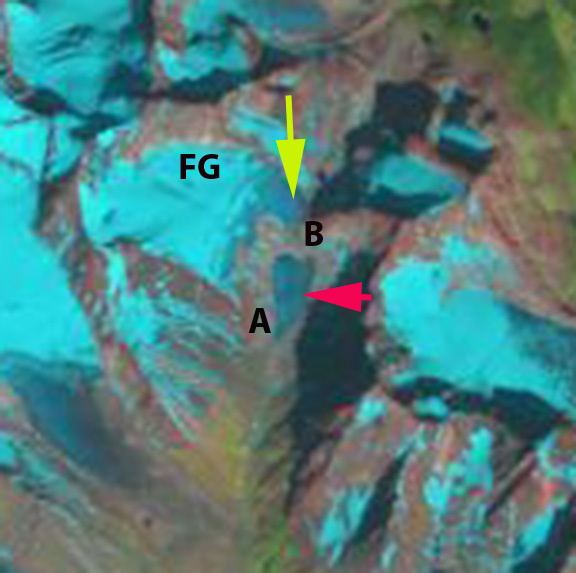 By 2005, a Google Earth image indicates the diminishing lower section of the glacier is 300 m long and less than 200 m wide, separated from the upper glacier by 250 m. By 2013 the lower glacier is no longer evident, there could be a small remnant of debris covered ice, but it is essentially gone. The glacier now is just 1.6 km long having lost half its length from the mapped glacier and more than half since the satellite image analysis of the 1980’s. The upper margins of the glacier have changed little and some snowpack has been retained. This suggests that now with the entire glacier in the upper basin above 2400 m, the retreat should slow down,and that the glacier can survive current climate (Pelto, 2010). The retreat of this glacier is similar to Apex Glacier, Petain Glacier, Coleman Glacier and Mangin Glacier. 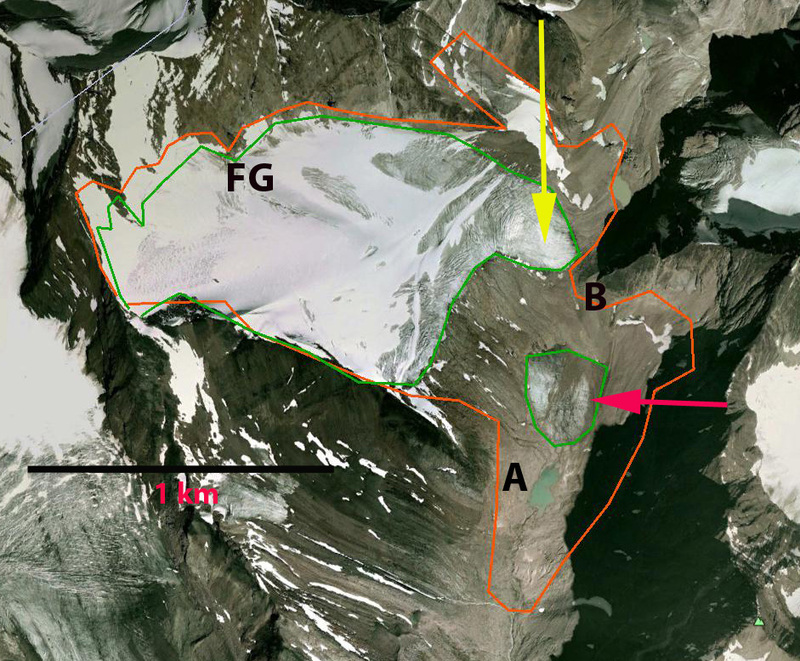 The retreat fits the pattern noted by Tennant et al (2012), further Jiskoot et al (2009) noted that the glaciers of the nearby Chaba-Clemenceau Icefield are experiencing faster retreat rates in recent years. All of this loss in glacier area of course means less glacier runoff, since the area lost is greater than the increased melt rate from the remaining glacier area in Alberta. This entry was posted in Glacier Observations and tagged alberta glacier melt, alberta glacier retreat, fraser glacier retreat, jasper glacier retreat. Bookmark the permalink.